150-gram opaque red vinyl pressed at Quality Record Pressings! 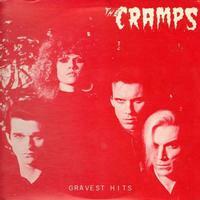 The Cramps emerged out of the first wave of punk music in the mid 1970's, frequenting clubs such as CBGB. Led by husband and wife team Lux Interior and Poison Ivy, this garage "psychobilly" band incorporated a unique flair for fusing camp, Link Wray-inspired riffs, B-movies, and bizarre performances. Gravest Hits was their debut EP featured the single "Human Fly." The original red cover hasn't been available since it was released in 1979. Now, the red cover is available again with the opaque red vinyl. The classic black cover corresponds to the 200 gram black vinyl. Customer Reviews (5.00 Stars) 1 person(s) rated this product. It's so cool to have this as a stand alone ep.. The mastering of this edition is far superior than the cd version ( same for DPLP 70 Songs the Lord taught us ).. Get a copy for yourself and enjoy a genuine made in Memphis classic..